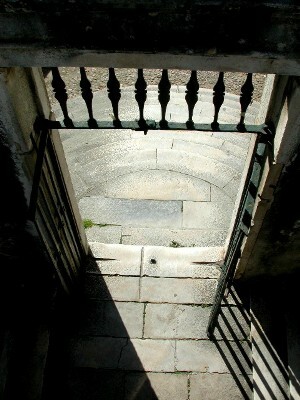 Фото "The Stairs of Minerva"
These stairs, named after the greek goddess of wisdom, leed to the Faculty of Law of the University of Coimbra. The University of Coimbra was founded in the Middle Ages and it`s one of the oldest universities in Europe. This is a Lesson of Photography in B&W. Very pretty photograph. Good photographic technique. Congratulations, Jorge Salgueiro. Superb shot nice use of light and shadow. i appreciate the dynamic composition here, created by the game of light, shadows, and lines. wish to see it posted larger. what about a crop at the top? Excellent composition and light ! Wonderful work. I like it! This eventually was caused by over-compressing the file in photoshop or other editing software, since you produced a 40Kb image out of the original file from your camera... it could have been around 120Kb (maximum allowed in this website), which means it could have been almost 3 times better (as in image quality and sharpness). I am rating the photo and not the photoshop skill but try to re-open the original file and compressing less - photoshop allows you to preview the filesize vs compression ratio quality. The difference is quite significant!